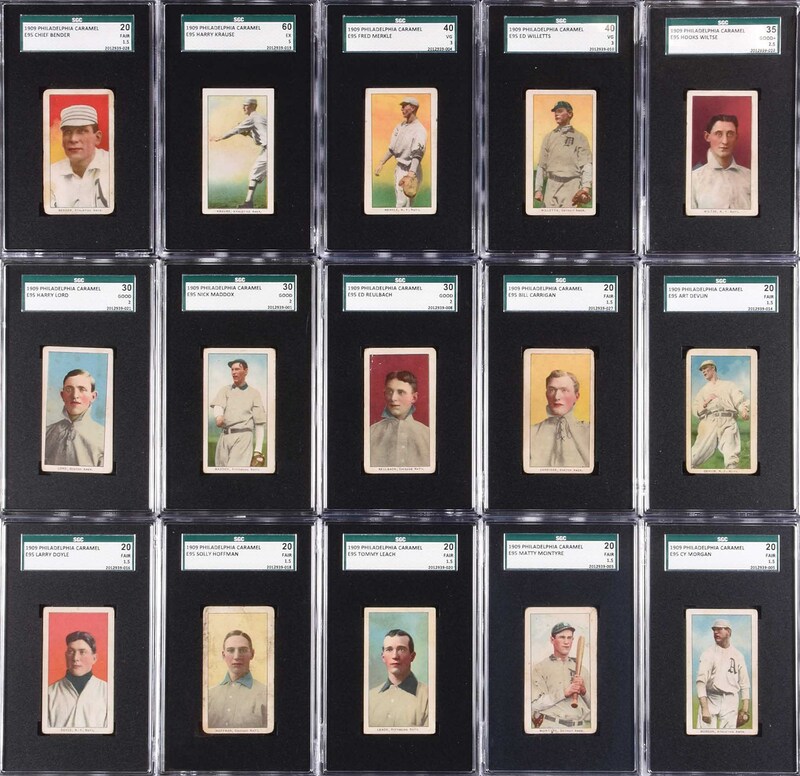 Complete set of E95 Philadelphia Caramel consisting of all twenty-five cards, highlighted by ten Hall of Famers, including Ty Cobb, Honus Wagner, Christy Mathewson, and Eddie Plank. Each card has been graded and encapsulated by SGC (all submitted by REA). SGC Condition Report: Two EX 60: Evers (HOF) and Krause. One VG/EX 50: Chance (HOF). Five VG 40: Collins (HOF), Mathewson (HOF), Merkle, Wagner (HOF), and Willetts. Three GOOD+ 35: Crawford (HOF), Willis (HOF), and Wiltse. Three GOOD 30: Lord, Maddox, and Reulbach. Ten FAIR 20: Bender (HOF), Carrigan, Cicotte (Black Sox), Devlin, Doyle, Hoffman, Leach, McIntyre, Morgan, and Plank (HOF). One Authentic: Cobb (HOF). This 25-card set was issued in 1909 by the Philadelphia Caramel Co. of Camden, New Jersey. The E95 set was almost certainly inspired by the great success that tobacco companies were having with their cards. This set is of special significance in that the E95 artwork was not reissued by other manufacturers, a practice that was so widespread with other “E” card issues. The designs used in E95 are unique to the set. These cards have a very distinctive look to them and the artwork is definitely a cut above their rivals of the time. 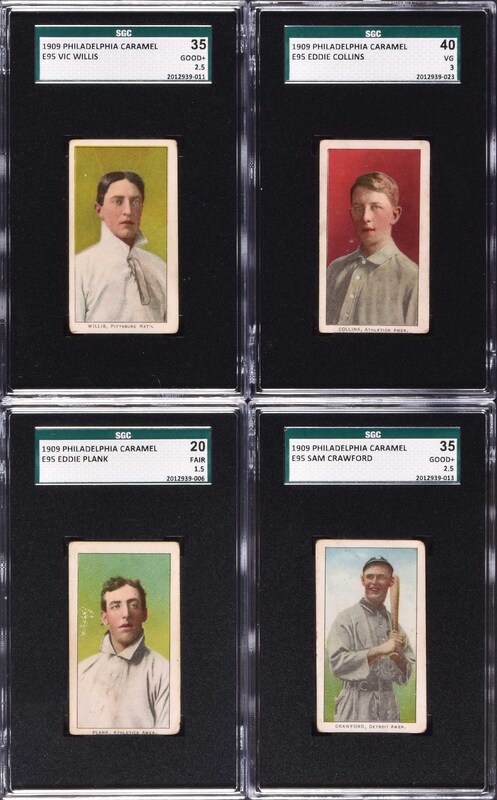 Due to the thin stock on which they are printed, E95 Philadelphia Caramel cards are rarely found in high grade. This is a very consistent complete set,with all cards presenting with bright colors and crisp images. 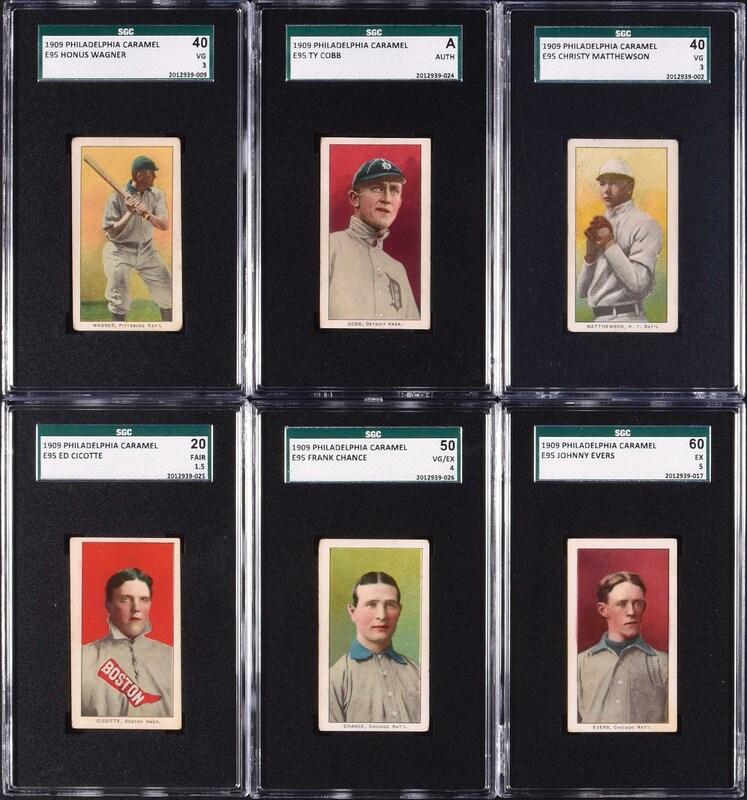 An outstanding complete set of one of the era's most popular issues! The equivalent SMR value for the assigned grades (factoring in the half-grades at the lower whole-grade level and excluding the Cobb card graded Authentic) is $7,245. Total: 25 cards. Reserve $2,500. Estimate $5,000+.